Incorporate our Amish made Ruff Sawn Live Edge Bed into your suite! 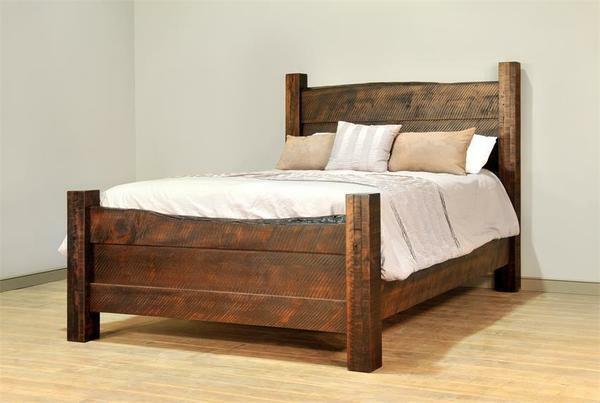 This Amish made bed is handcrafted with a bold panel footboard and headboard that both include a live edge top. Attached to both the headboard and footboard are solid posts ensuring stability and beauty for generations. Our Ruff Sawn Live Edge Amish Bed comes standard with four wood slats that have center supports for added strength. The construction of this bed is configured to be used with a mattress and box spring. Handmade from solid wormy maple wood, you will get to choose the finish color that best matches the rest of your bedroom decor. Choose a twin, full, queen or king size for your new live edge bed! If you have any questions, please call us at 866-272-6773 to speak with one of our Amish Furniture Specialists. Our furniture professionals will be here to help you with any questions that you have and get you custom quotes from our woodshops if you would like to customize this bed. We are also easy to reach via email at Questions@DutchCrafters.com. Note on Assembly: Assembled using an angled bracket that bolts to the side rail and to the post.